LCC is privileged to go on annual trips to Solisterra. Whether for grade 8 enriched math, Green Team leadership, or senior service trips, we have been going on these trips for the last five years. The very first year LCC students went to Solisterra, they built a three-storey playhouse fully equipped with a fireman’s pole and slide. The next year, the students participated in a community project building a gazebo in Kazabazua made from the ruins from the oldest house in the town. 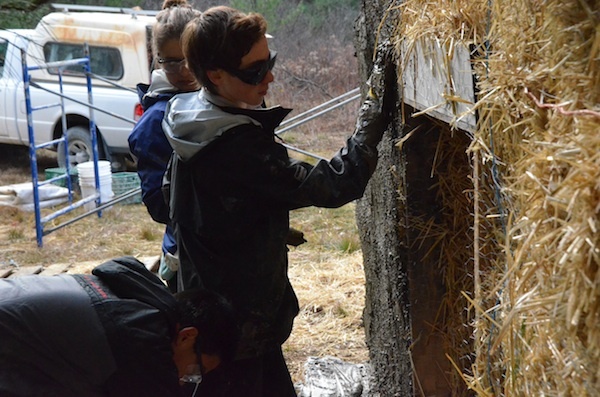 During the third year, our most “ambitious” year, the students built an 80 foot tall windmill made with cement blocks weighing 1.2 tons each–not to mention the straw bale workshop as well as chicken coop which is now home to 15 roosters and hens. The following year, student leadership along with the grade 8 enriched class built a solar shower, straw bale generator shed, chicken run and rocket stove to keep the chickens warm. 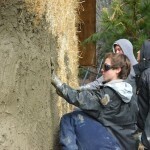 In April of this year, the senior service trip students finished the solar shower and straw bale workshop. A big thank you to all who have participated over the years. I was lucky enough to be a part of this year’s enriched math trip and I would like to share what it was like for us. Three weeks ago, 20 of my classmates, Ms. Webster, Ms. Saunders, Mr. Clark, M. Tremblay and I embarked on a three-hour bus ride to Solisterra not quite knowing what to expect. When we arrived, we quickly learned that bug spray was absolutely no help against the vicious swarms of insects that attacked us the second we walked off the bus. Ms Saunders got us quickly engaged building model rocket stoves followed by roasting marshmallows and a nighttime hike. For our sleeping quarters we were separated into two houses, Pinia and Rose. 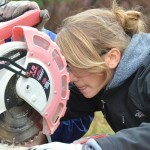 The next day we were on the building worksite by 7:30 am after consuming the best homemade bread ever. 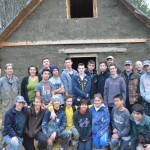 One small group went to parge, another worked on the rocket stove bench, and the other worked on a pizza and bread oven. The work was hard and tiring, but always exciting and rewarding. Thank goodness for the amazing snacks and meals that were made for us by Deb! We spent the next two days alternating projects and having a blast. It goes without saying that we were all a bit reluctant to get on that bus back to the city. This past weekend, 21 grade 8 enriched-math students participated in a community service trip to Solisterra in Kazabazua, Quebec. 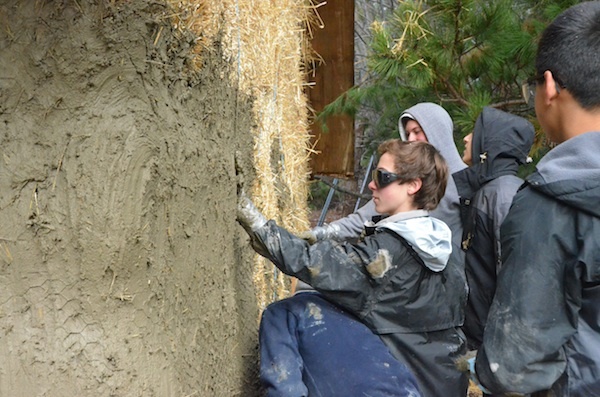 Students had hands-on experiential learning with renewable energy sources and sustainable construction while living in a straw bale house for two days, operated mainly by solar power. They completed two projects: the assembly and launching of an 80-foot windmill and the building of a straw-bale chicken coop. Four chickens were on site eagerly awaiting their new home! From November 1 to 3, math-loving grade 9 and 10 students departed for Kazabazua, a small town three hours north of Montreal, to help build a straw bale structure. We stayed at Solisterra, an eco-friendly community of straw bale buildings built by Frank Dutton and Dominique Tonetti. The boys stayed in Rosa, the main house, whereas the three girls (plus Ms. Saunders) stayed in Pinea across the lake. The group worked on a straw bale shed designed to house tools and solar panels, which provide energy for the buildings in Solisterra. 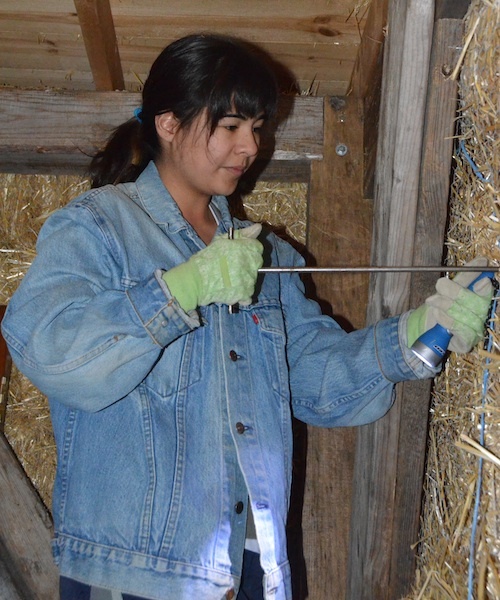 Our job consisted of adding and preparing the straw bales for the shed, as well as parging the finished walls; this included placing and modifying bales, stapling chicken wire, and even sewing the bales! Our group was very productive, and by 5 pm Saturday, we had finished parging all but the second floor interior and one main level wall! This job required a tremendous amount of physical labour, but we had plenty of sustenance thanks to the delicious meals and snacks provided by our chef, Deb. After all of our hard work, we were rewarded with a trip to the town’s harvest dinner before the long drive back home. Three weeks ago, the grade 9 and 10 enriched math classes were invited to go on a community service trip to the town of Kazabazua in Quebec. The moment this was presented to me, I knew I wanted to go. Three hours later, my form was already handed in. I could not wait to go back to Kazabazua for the second year in a row. There we slept in a straw bale house at the Solisterra Eco-Cottages. We were going to stay for two nights and work for two days. Our task was to build a straw bale shed that would create solar energy by using solar panels and be used as a storage room. Straw bales were going to have to be modified and sewed together to make the walls. The entire shed was going to have to be chicken wired. And finally, the walls of the shed were going to have to be parged with a mixture of cement, sand and water. So much to do! The highlight of my trip was learning the art of parging under the guidance of Andrew the expert. 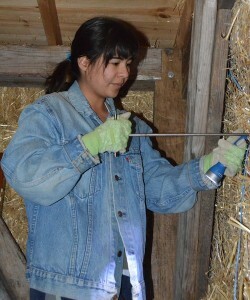 Saturday consisted of applying the first layer of parging on the walls of the straw bale shed. Making the parging was a lot of fun. We got to observe how adding different ingredients changed the texture and stickiness of the parging. 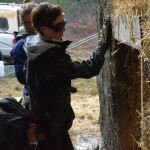 Covering the straw bale walls was my favourite part of the process, as I applied this gooey playdough-like substance with my hands. Needless to say, I got very dirty. This year the grade 9 and 10 enriched math classes were invited for a second time to Solisterra in the town of Kazabazua. When I heard that I had a second opportunity to head out for Solisterra and work on another outdoor building project, I couldn’t wait to sign myself up. Not only was I super excited to work on a straw bale shed and learn how to sew the bales together and apply the paraging, but I was also grateful to be able to spend another weekend on the actual property of Solisterra. I loved working on the shed all weekend but what I want to share is how inspiring and relaxing Solisterra actually is. Solisterra is located in a small town one hour north of Ottawa called Kazabazua. It is a property of 350 acres and there are two straw bale houses on it, one playhouse and now there is a straw bale shed! There are two beautiful lakes on the property as well and the land is covered in trees. The nicest part of the trip was walking in silence, in the pitch black, through the property from one house to another. As we walked, we heard the sounds of our own footsteps and the rain lightly hitting the trees, the wind that rustled through the leaves and the sound of coyotes way off in the distance.